When Xenoblade Chronicles was announced for localization on the Wii, my heart skipped a beat. While there are plenty of JRPGs to go around, the more the merrier, and I wouldn't pass up the chance to experience another Monolith Soft game. I didn't quite have the same reaction to Xenoblade Chronicles X at first, but it really grew on me over time. X's timeline starts in 2054 AD, when a mysterious alien race assaults the Earth and decimates the human race as we know it. Arks deploy across the universe, and the only known survivor is the White Whale, which crash lands on the distant planet Mira. Cue a quest to kickstart mankind's new home, and you have your basic gist of what's going on. To be clear, the story is not related to the original Xenoblade in any way. You do not need to have played the other game to have an idea of what's going on, and by JRPG standards, X's story is rather clear and concise. The player goes through the experience as a silent protagonist, with a minor amount of dialogue choices (more like moods) in tow. There is no branching narrative here -- instead, you'll follow a linear storyline, with the ability to take control of any party member as your primary avatar, including the one you create. Where X really shines isn't by way of its serviceable, yet sometimes drawn-out story; it's the ability to create your own adventures. Through the use of a lone base (New LA) and a formidable, yet vulnerable organization called BLADE, you'll slowly learn more about Mira, the creatures that inhabit it, and the dangers involved beyond the alien race trying to wipe out your species. The giant, sprawling maps (of which there are five, all accessible at the start) are a dream come true for exploration enthusiasts, with secrets at every turn and points of interest every minute or so. While the visuals aren't anything to gawk at on a grand scale, the draw distance is absolutely incredible, to the point where I'm in awe Monolith was able to squeeze these textures into a Wii U title. Walking around in X is wondrous, and spotting giant screens-high enemies and world bosses (Indigens and Tyrants, respectively) is something you need to do yourself to truly grasp the game's scale. Players will start off with a male or female avatar of their choosing, and it's off to the races, with a rather quick tutorial session. 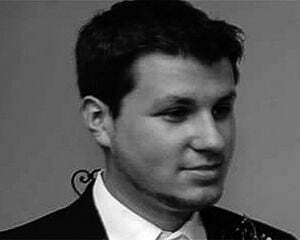 From there, the game completely ceases to hold your hand, which is going to be a massive point of contention for some. Point blank, X is not a game you can casually pick up and play -- you need to immerse yourself in it. This not only goes for leveling up your character, but unlocking the requirements for story missions. 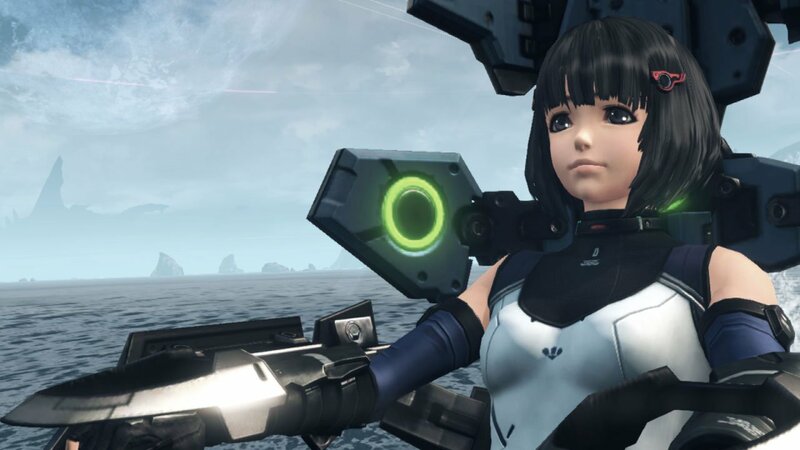 Xenoblade Chronicles X is a tough and unforgiving game if you have no affinity toward the JRPG genre. Sure, there are a few modern conveniences peppered in, like fast travel, a detailed world map (accessible at all times on the GamePad screen), and the ability to save anywhere, but you will need to master nearly every facet of X to progress past the first few chapters. Hell, you'll need to actually read the manual to pick up on a few major things, old-school style, and I ended up taking paper notes just like I did in the NES days. It's going to be a polarizing thing for sure, but personally, I'm stoked to play something like this again. Learning all the game's ins and outs was a joy. It's particularly satisfying to take everything in and feel like you've accomplished something. The battle system is just as unforgiving as a lot of other aspects of X. It's based on an auto-attack system that presents you with a few skills at the start (such as power attacks or debuffs), but after a few hours the learning curve really ramps up. Players will have to juggle between ranged and melee attacks and abilities, both of which have their own styles, pros, and cons. By way of an MMO hotbar with icons and cooldowns, you'll have to micromanage all of the tools available to you, learn what abilities combo with others, and divine the right time to use them. Combat is also nuanced in practice, as enemies often have appendages that can be broken for strategic value. On paper it sounds like basic stuff, but once I earned the dodge and block abilities, timing became absolutely key to surviving a boss battle. Additionally, mastering other facets like the Soul Voice system (a harmless QTE that pops up occasionally, allowing you to heal your party), and knowledge of passive skill synergy will help. 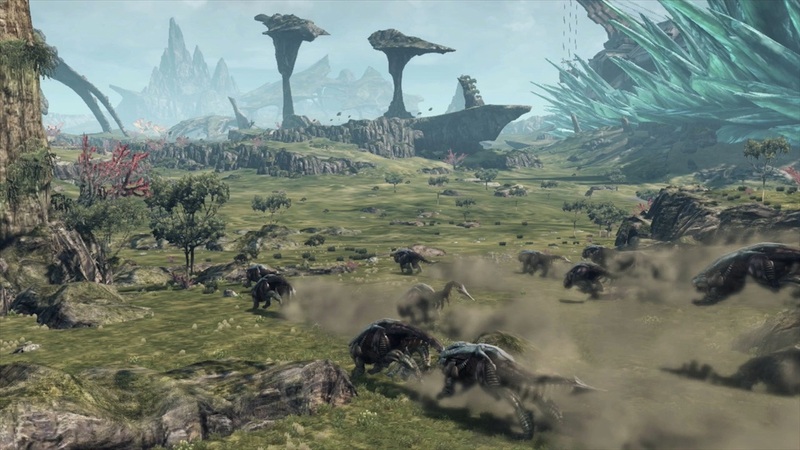 If all of that sounds scary, maybe Xenoblade Chronicles X isn't the game for you. Don't worry about the controls though. They work great, mostly thanks to the GamePad. As mentioned previously, it's constantly available as a map and fast travel datapad of sorts. If you're so inclined you can also use the Wii U Pro Controller, which works fine as well. In terms of length, X hits that sweet spot a lot of games in the genre tend to provide -- 50 hours or so for the story, and double that to do everything. What sets this JRPG apart from most of the competition however, is its ability to grab the player's attention throughout, and not just during specific juicy story sections. I would often spend hours at a time just aimlessly wandering around, finding mining locations to raise my income, and hunting down Tyrants. Every zone has a distinct feel to it, and in all, I've probably spent 10 hours in each individual area. Skells (mechs) have been a huge part of the game's marketing scheme, and it's important to know that you won't get them until roughly 20 to 30 hours into the core story (this is assuming you only do a light amount of exploring on top of that). After unlocking the opportunity to even obtain the license to pilot one, you'll have to complete a lengthy multi-tier optional questline. When I had first heard that figure based on player's experiences with the Japanese version I was turned off, but actually playing X, I quickly forgot about them, and when Skells did arrive, they felt like a cherry on top, opening up brand new exploration options via flight. Xenoblade does come with an online component, and just to be clear, I wasn't able to fully test it out. In addition to multiplayer squad support, there's also a system where you can recruit or interact with potential party members in an asynchronous manner, the latter of which I personally did have access to during my review period. It's a nice little bonus, as adding in a member from a vast online pool of players (even pre-launch) can help you fulfill a need in your party makeup that may be missing. Otherwise, this can be played completely offline, without any fear of missing out of an essential part of the game.